Attorney General Jeff Sessions heatedly denied on Tuesday having an undisclosed meeting with Russia's ambassador to the U.S. and declared it was a "detestable and appalling lie" to suggest he was aware of or took part in any collusion between Russia and the election campaign that sent Donald Trump to the White House. 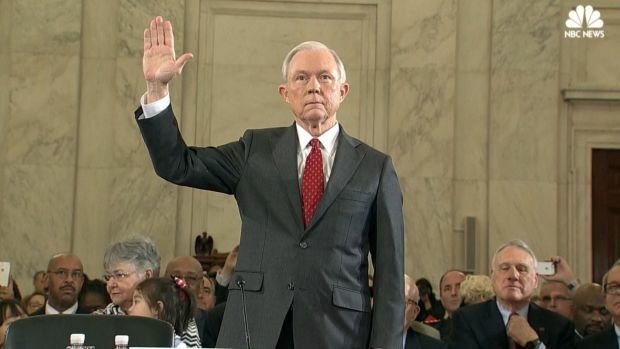 Testifying at a packed Senate hearing, Sessions, who was a close Trump adviser during the battle for the presidency, also rejected any idea of misconduct in the ouster of FBI Director James Comey and vowed to defend his honor "against scurrilous and false allegations." In his dramatic appearance before former colleagues, Sessions contradicted a contention made by Comey at a hearing before the same panel last week. 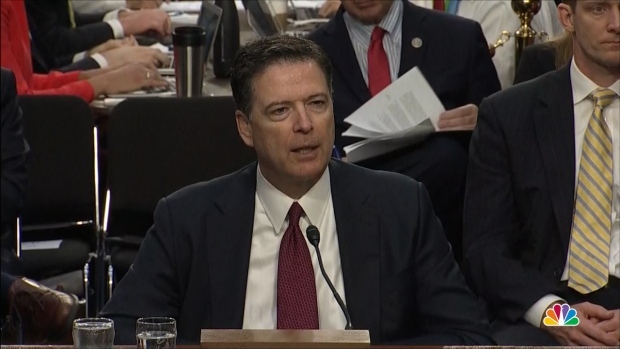 Comey told the intelligence committee that, after an encounter with President Trump in which he said Trump pressured him to back off an investigation into the former national security adviser, Comey implored Sessions to make sure he was never left alone with the president again — but Sessions didn't respond. "He didn't recall this, but I responded to his comment by agreeing that the FBI and Department of Justice needed to be careful to follow department policy regarding appropriate contacts with the White House," Sessions said. Attorney General Jeff Sessions is expected to testify in front of the Senate Intelligence Committee June 13 as the president heads to Wisconsin to talk jobs. The former Alabama senator also defended himself against accusations that he misrepresented himself during his confirmation hearing when he said he hadn't met with Russian officials during the campaign. Sessions argued that in the context of that hearing, "my answer was a fair and correct response to the charge as I understood it." The attorney general stepped aside from the Justice Department probe into Russian meddling in the campaign on March 2, the day after The Washington Post reported on two previously undisclosed meetings with Russian Ambassador Sergey Kislyak. Days after that, Sessions also corrected his confirmation hearing testimony to inform the committee about his two meetings with Kislyak. Ahead of the hearing there had been suggestions that Sessions might have had a third, unreported encounter with Kislyak in April 2016, at Washington's Mayflower Hotel, where candidate Trump was giving his first major foreign policy speech. Sessions was adamant that he did not have a private meeting with Kislyak at that event. He did allow for the possibility that he encountered him in a reception that he said was attended by a couple dozen people, though he said he had no specific recollection of that. Democratic senators have seized on the possibility of a third meeting to suggest that Sessions has not been forthcoming about the extent of his communications with the ambassador. Sens. Al Franken of Minnesota and Patrick Leahy of Vermont have sought an FBI investigation. Sessions testified Tuesday that he recused himself from the current Russia investigation only because of a regulation that required it because of his involvement in the Trump campaign. 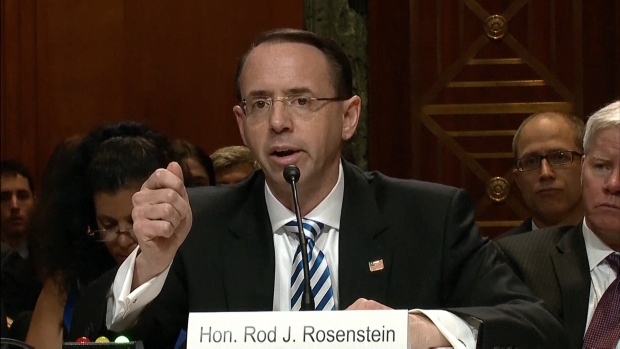 Deputy Attorney General Rod Rosenstein appeared before a Senate Appropriations Subcommittee and said he has seen no basis for firing special counsel Robert Mueller, who is overseeing the Russia investigation. "Many have suggested that my recusal is because I felt I was a subject of the investigation myself, that I may have done something wrong," Sessions added. That was not so, he said. And while he had recused himself from the Russia probe, Sessions insisted, "I did not recuse myself from defending my honor against scurrilous and false allegations." Democratic Sen. Ron Wyden of Oregon aggressively asked Sessions about suggestions arising from Comey's testimony last week that there was something "problematic" about his recusal. Wyden asked Sessions what problematic issues existed. "Why don't you tell me? There are none, Sen. Wyden, there are none," Sessions insisted, his voice rising. "This is a secret innuendo being leaked out there about me, and I don't appreciate it." 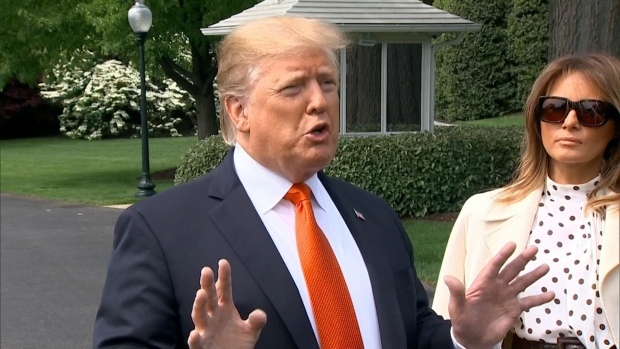 White House spokeswoman Sarah Huckabee Sanders told reporters later that Trump thought Sessions "did a very good job" and was especially "strong" on denying any collusion between Trump's campaign and Russia. During the hearing, Sessions lent his support to the special counsel, Robert Mueller, who is now in charge of the Trump campaign-Russia investigation. "I have confidence in Mr. Mueller," he said. At a separate hearing Tuesday, Deputy Attorney General Rod Rosenstein declared he'd seen no basis for dismissing Mueller, the former FBI director he appointed as special counsel after Sessions' recusal. A friend of the president suggested a day earlier that Trump was considering such an ouster. Rosenstein said he would agree to dismiss Mueller only if there were a legitimate basis to do so, and an order from the president would not necessarily qualify. 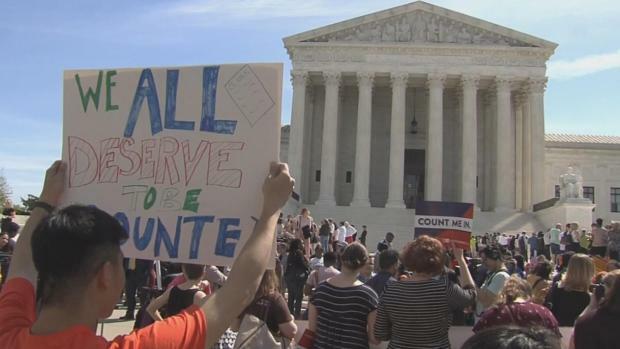 Mueller also won votes of support Tuesday from the top two Republicans in Congress, House Speaker Paul Ryan of Wisconsin and Senate Majority Leader Mitch McConnell of Kentucky, both of whom said they have confidence in him. As for Comey's firing, Sessions told senators that his recommendation had nothing to do with the Russia probe, that he and his second-in-command, Rosenstein, had a "clear view ... that we had problems there, and it was my best judgment that a fresh start at the FBI was the appropriate thing to do. And when asked I said that to the president." 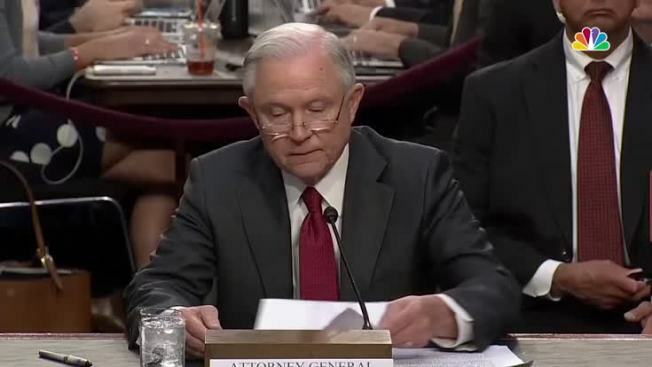 Sessions criticized Comey's handling of the Hillary Clinton email investigation, which the White House had initially cited as the ostensible reason for his firing. Comey's decision to announce last year that Clinton would not be prosecuted over her emails was a "usurpation" of the Justice Department's authority, Sessions said. Asked about Trump's own contention that the president fired Comey with the Russia probe in mind, and regardless of any recommendation from anyone else, Sessions said: "I guess I'll just have to let his words speak for themselves. I'm not sure what was in his mind specifically." Sessions refused to say whether he had ever discussed the Russia investigation with Trump, arguing that he could not disclose private communications with the president. Democratic senators pressed him on the legal rationale for his refusal to discuss those private conversations, as Sessions acknowledged that Trump had not asserted executive privilege around the hearing. He asserted that "I am protecting the right of the president to assert if it he chooses and there may be other privileges that may apply." Sessions maintained that he had not been briefed on the Russia investigation between the time of his February swearing-in and his March 2 recusal. "As such," he said, "I have no knowledge about this investigation, as it is ongoing today, beyond what has been publicly reported. I don't even read that carefully. And I have taken no action whatsoever with regard to any such investigation." On another hot-button issue, Sen. Marco Rubio, R-Fla., asked Sessions whether Trump records his conversations in the White House. Trump has suggested there might be tapes of his encounters with Comey; Comey said last week that "lordy" he hopes there are. "I do not," Sessions said when asked whether he knows whether the president records his conversations. Would any such tapes have to be preserved? "I don't know, Sen. Rubio, probably so," Sessions replied.